These mammals are called monotremes because they have a common rear opening known as the cloaca. This is a primitive ('basal') feature of tetrapods, which monotremes, birds and reptiles have today. The more 'advanced' ('derived') mammals have the system where the rear has two openings. What sort of animal is it? The platypus looks similar to a beaver with a brown, furry body and wide, flat tail. Unlike a beaver, it has webbed feet (joined toes), which are good for swimming. Its nose is large and rubbery. The platypus is sometimes called "duck billed platypus" because of this nose. It is similar to a duck's bill (mouth). Platypus can be big or small. The larger platypus live in Tasmania while the smaller ones live in Queensland. Adults can be less than 1 kg (2 lb) or up to 3 kg (7 lb). Its body can be from 30 cm (12 in) to 40 cm (16 in) long. Its tail can be from 10 cm (4 in) to 15 cm (6 in) long. Males are about one-third (1/3) larger than females. The platypus lays eggs in its nest. When the babies come out of the eggs after about ten days, they hold on to the mother. The mother makes milk for the new babies. The young platypus drinks the milk from the mother's skin while she lies on her back. At six weeks the babies have fur and are able to leave the burrow for short trips. After four months they no longer need their mother's milk. National Geographic magazine had a story on the platypus in 1939. Many people all over the world had never heard of the platypus. The story told how hard it is to raise platypus babies in zoos. (Raising is helping little babies to grow). Even today, humans have raised only few platypus. David Fleay at the Healesville Sanctuary in Victoria had the first successful zoo raised platypus in 1946. He nearly did it again in 1972 at the David Fleay Wildlife Park at Burleigh Heads, Queensland, but it died at 50 days. Healesville raised another in 1998 and again in 2000. Taronga Zoo in Sydney bred twins in 2003, and had another birth in 2006. ↑ "Platypus facts file". Australian Platypus Conservancy. http://www.platypus.asn.au/. Retrieved 2006-9-13. ↑ 3.0 3.1 3.2 3.3 3.4 "Platypus". Department of Primary Industries and Water, Tasmania Online. http://www.dpiw.tas.gov.au/inter.nsf/WebPages/BHAN-53573T?open. Retrieved 2008-12-23. ↑ Moyal, Ann Mozley (2004). Platypus: the extraordinary story of how a curious creature baffled the world. Baltimore: The Johns Hopkins University Press. ISBN 0-8018-8052-1 . http://books.google.com?id=5DkezNMhSTYC&printsec=frontcover. ↑ "Wildlife Finder - Platypus". BBC. http://www.bbc.co.uk/nature/species/Platypus. Retrieved 2009-10-03. ↑ "Earning their spurs" (in English). Australian Playpus Conservancy. http://www.platypus.asn.au/earning_their_spurs.html. Retrieved 2009-12-16. ↑ 7.0 7.1 "Platypus". Evironmental Protection Agency, Queensland Government. 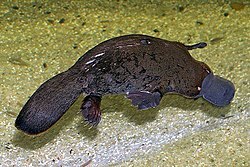 http://www.epa.qld.gov.au/nature_conservation/wildlife/native_animals/platypus/. Retrieved 2008-11-13. ↑ "Kangaroo Island". Island Life, Australian Broadcasting Commission. http://www.abc.net.au/nature/island/ep6/default.htm. Retrieved 2008-11-13. ↑ Anthony Scott and Tom Grant (1997-11). "Impacts of water management in the Murray-Darling Basin on the platypus (Ornithorhynchus anatinus) and the water rat (Hydromus chrysogaster)" (PDF). CSIRO Australia. http://www.clw.csiro.au/publications/technical97/tr23-97.pdf. Retrieved 2006-10-23. ↑ "David Fleay's achievements". Queensland Government. 2003-11-23. http://www.epa.qld.gov.au/nature_conservation/wildlife/david_fleay_wildlife_park/50_years_wild/david_fleays_achievements/. Retrieved 2006-09-13. ↑ "Platypus". Catalyst. 2003-11-13. http://www.abc.net.au/catalyst/stories/s988946.htm. Retrieved 2006-09-13. This page was last changed on 3 December 2014, at 04:50.